By clicking "Receive My Guide", you are providing your signature and express "written" consent to be contacted by or behalf of Reverse Mortgage Funding LLC, its affiliates and/or its agents (collectively Company) at the telephone, email or mailing address that you have provided for purposes of fulfilling this inquiry about reverse mortgages and/or the Company's products or services, even if you have previously registered on a "do not call" government registry or requested Company to not send marketing information to you by email and/or direct mail. You agree that the Company may use automatic telephone dialing systems and prerecorded voice messaging in connection with calls or texts made to the telephone number you provide even if the telephone number is assigned to a cellular or mobile telephone service or other service for which the called party is charged. You understand that you are not required to consent to receiving autodialed calls or texts as a condition of any reverse mortgage and/or purchasing any Company products or services. If you do not wish to authorize Company to contact you in this manner, you can call 888-277-1567 to complete your request. You understand that you can revoke this consent at any time. You’ve worked hard to get to this point. Now you’d like to live in a “right-sized” home that fits your needs today, and get comfort and financial peace of mind for the future. Perhaps you want to move to a home that’s closer to family, more maintenance- free, or in a more social neighborhood. But maybe you don’t think you can afford to move because of your financial obligations, income, or other issues. Fortunately, there’s an established financing option for homebuyers who are age 62 and older that can help you get the funds you need to buy the home you want. HECM for Purchase (H4P) is a Federal Housing Administration (FHA)-insured home financing program designed specifically for homebuyers who are age 62 and older. It’s specifically designed to help you get the funds you need to buy the home you want at this point in your life — with fewer financial worries and limitations. 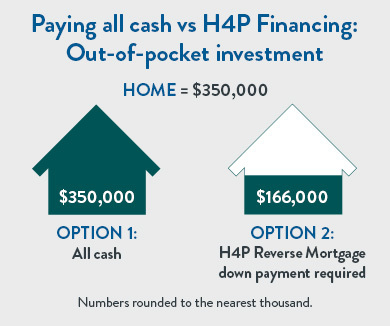 With H4P, you can purchase a home by combining a one-time investment of your own funds (down payment) with loan proceeds from a Home Equity Conversion Mortgage (HECM) to complete the transaction. As with a traditional “forward” mortgage, the home you are purchasing secures the loan. However, unlike a traditional mortgage, there are no monthly mortgage payments, which can help boost your cash flow. You own the home as long as you live in it. The loan does not have to be repaid until you sell the home or no longer live there as your primary residence. In order for the loan to remain in good standing, you must meet certain home ownership obligations — which include maintaining the property, and keeping current with property-related taxes and insurance payments. Here’s a hypothetical example, to show you how it can work. Let’s say your home is owned free-and-clear, and you want to buy a smaller home that’s closer to your children and their families. The price of the home you want is $350,000, and you’re asking $425,000 for yours. You could use the money from the sale of your home to pay all cash for the new one; after paying realtor fees and taxes, this would leave you with about $40,000 and no monthly mortgage payment. However, by using an H4P loan instead, you could buy the new home with only $165,737 of your own funds — keeping $144,263 more than if you paid cash, and still having no monthly mortgage payment. (As with any mortgage, you would still be responsible for paying property-related taxes, insurance and upkeep in order for the loan to remain in good standing.) This could make it easier for you to afford options or upgrades you want or need. Then you could take the remaining funds and invest them in your retirement. This example is for illustrative purposes only. Closing costs may include an origination fee, third-party closing costs, and an FHA Mortgage Insurance Premium. Interest rates and funds available may change daily without notice. Please contact us for details of credit costs and terms. Single-family homes, townhomes, and FHA-approved condominiums are eligible as long as you use the home as a primary residence. Otherwise, requirements are simple and straightforward. You must be age 62 or older; the home you buy must be your primary residence. To learn more and find out if you may qualify, contact us today. * Subject to certain restrictions.